This Beautiful Wheel of the Year has been *Hand Decorated* with the Art of Pyrography. Around the outer edge of this Charger we have Burnt the Eight Witches Sabbats and their corresponding dates. 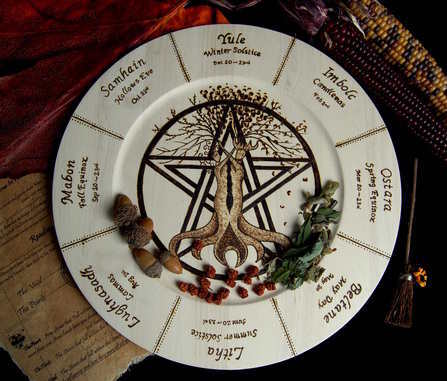 At the centre of the Offering plate is a Tree of Life Design. The Trunk of the Tree shows the union between the God and the Goddess, in perfect balance with their Roots deep in the Earth and their Branches outstretched to the sky. With a Pentacle design as their Backdrop! The Wheel of the Year shows the Natural cycle of Life. Through Birth, Life, Death and Rebirth the never ending Wheel Turns. This Beautiful Offering Plate has been Hand Decorated and Measures approx 13" (33cm) in diameter.